The most carefully guarded secrets of the PBM industry involve tens of billions of dollars in rebates they collect from drug companies. Those payments help drugmakers secure favorable spots on medication menus that PBMs offer to millions of patients. On average, these and other discounts mean manufacturers lop 44 percent off list prices of brand-named drugs, according to Quintiles IMS Holdings Inc. Express Scripts and CVS say they pass along to clients about 90 cents out of every dollar in rebates. T's comment: I interpret Mark's statement above as a shot across the bow of plan sponsors and their agents. 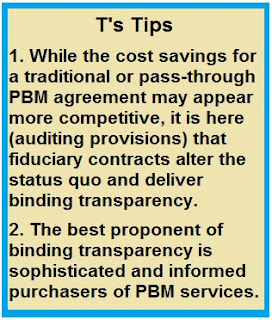 He is suggesting that they [plan sponsors] are unsophisticated purchasers of PBM services and don't do a good job at driving disclosure of contract details important to them.. Plan sponsors need to understand not only what they want to achieve in their relationship with their PBM but also the competitive market and their ability to drive disclosure of details on services important to them. Still, the terms often require a rigor associated with intelligence agencies. MedImpact Healthcare Systems Inc., for instance, doesn’t permit auditors “to copy, notate or otherwise capture the terms of any pharmaceutical manufacturer rebate contract” or to reveal them to anyone else, including clients, according to a nondisclosure agreement seen by Bloomberg News.